Last week I talked about the awesome $5 app for the iPad (and iPhone) MultiCam from RecoLive that lets you record a multi-camera session using cameras on your iOS devices and Mac and even your desktop. I had one complaint that I wasn’t able to use an external mic, because Multi-Cam simply didn’t have an option to choose between microphones. I tried to use a USB mic plugged into the iPad but I think because I had to use not only the Camera Connection Kit but also the 9 pin to 30 pin dock connector adapter, the iPad just said it wasn’t supported. This week I remembered that ages ago Steve bought me a device called the ProJive XLR from CableJive that might do the trick. Big girl mics have XLR connectors, which is a three-pin connector, and the ProJive accepts the XLR connector. On the other end it has an audio connector that you plug into the headphone jack on the iOS device. 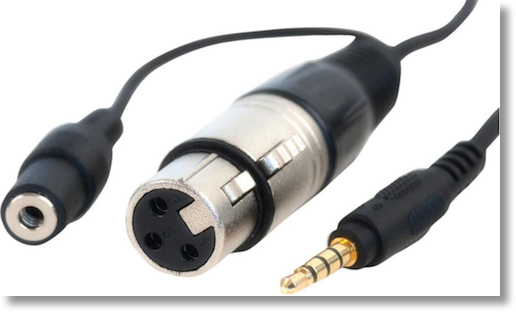 I’ll never understand how you can use a microphone by plugging into a headphone jack, but it actually works. The ProJive also has a monitor cable so you can plug in a set of headphones to monitor your own audio. I plugged my Heil PR40 into the ProJive, and the audio jack into the iPad and fired up MultiCam and it worked perfectly – good audio AND video! HI Allison where can I find your tutorial on how to set up your podcast studio? I have looked and can’t seem to find it . I have a PR40 and want to get some ideas from you .. thanks ..